That’s not to say that it is restricted to that industry though. The theme just presents a design, it may be that the design is a fit for your industry as well. To re-iterate; the theme just provides the design. Features come from plugins that you can pick and choose. You might think that adding some different plugins could turn Outlet into the perfect theme for the fashion industry as well. 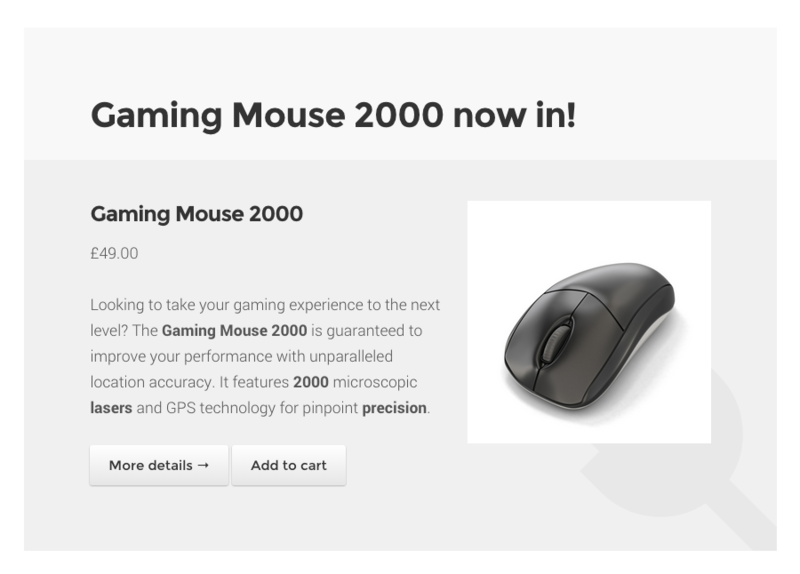 The Storefront Product Hero extension is used to display the featured product on the homepage. It’s added by simply inserting the Storefront Product Hero shortcode into the homepage content. The Storefront Designer extensions offers many features. This demo makes use of just one; the Sticky Navigation. You’ll notice this feature in effect when you scroll down any page on this demo. Notice that the navigation sticks to the top of the browser window. This effect is provided by the Storefront Designer extension. On single product pages there are pagination links between products. This feature is provided by the Storefront Product Pagination extension. The recent reviews section on the homepage are provided by the Storefront Reviews extension. On product archives (IE the shop page) you’ll notice that as you scroll products are loaded automatically, without having to click onto the next page. This feature is just one of many provided by the Storefront WooCommerce Customiser extension.